A farmer in Xi’an named Yang was drilling for water when he found the Terracotta Army in 1947. 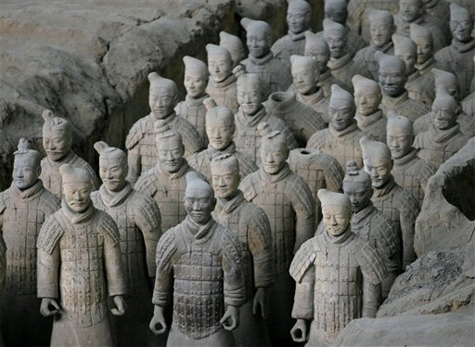 The Army was carved by 700,000 forced workers and was buried underground in front of the tomb of Qin Shi Huang so they could protect him in the afterlife. Qin Shi Huang was the first Emperor to unify China and is as much reviled for his tyranny as he is admired as a visionary. Tens of thousands of human and animal statues were created in several pieces and then assembled, each of which is unique. Actual weapons and armor were used in the manufacturing of the warriors but they were stolen shortly after the creation of the tomb. Despite the impressive discoveries in Xi’an, the tomb of the emperor has yet to be found. The Terracotta Army is our doorway to understanding how the real Qin Dynasty army functioned. By examining these clay warriors we can determine the formations of the army and what kind of weapons they used as well as their quality. Fine bronze swords, daggers, billhooks, spears, halberds, axes, crossbow triggers and arrowheads were all found in the pits at Xi’an.